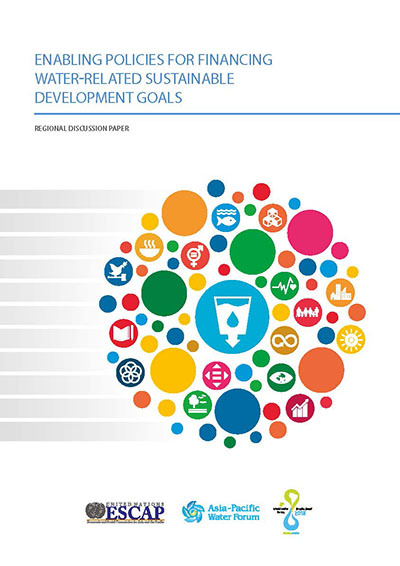 This discussion paper is focused on exploring policies, actions, and strategies to attain the Sustainable Development Goals (SDGs) by improving the resilience of water systems and infrastructure. This requires strategic mobilization of public resources and augmenting the opportunities for private investment. The contents of this discussion paper were developed and refined based on the outcomes of two regional sessions, coordinated by ESCAP at the 3rd Asia-Pacific Water Summit (3rd APWS, Yangon, 2017) and the 8th World Water Forum (Brasilia, 2018). To attract investments and make progress towards the achievement of the water‐related SDGs, countries in the region need to focus on policy actions and define strategic frameworks to improve the financial sustainability and resilience of water systems and infrastructure. In all presentations, shared at various intergovernmental platforms, speakers pointed out that governments should strategically mobilize public resources and expand opportunities for private investment. Experts also shared various regional initiatives, including the lessons learned from macroeconomic perspectives as well as local level innovations. The World Bank proposed a step‐by‐step framework to improve the credit‐worthiness of utilities; the Asian Development Bank shared the lessons learned in financing of the irrigation sector (the primary water‐user of the region), which involves institutional, structural and financial reforms. Apart from regional and national level experiences, various experts also shared practices for possible replication, such as: (i) the experiences of Japan and other disaster‐prone countries in the region; (ii) the experience in developing ODA financing tools to improve water security and financing of water infrastructure of the Republic of Korea and the Peoples’ Republic of China in collaboration with several developing countries; (iii) the example of privatization of operations as conducted by Manila Water; and (iv) the decentralised financing schemes for wastewater treatment systems, as shared by Indonesia. Effective regional examples are highlighted in water cycle management, raising attention to the multiple entry points for impactful investments within water cycle loops, namely in the local water cycle loop (short, such as in water recycling in a city and at the community management scale), the medium loop (in water services for food and industrial use), or in the long cycle (such as in storage, or in using cascading effects of nature in the wastewater treatment). • leveraging the role of the private sector to help attain water‐related SDGs and to implement impactful investments from public and private sources.